What determines whether cores form single stars or multiple stars? 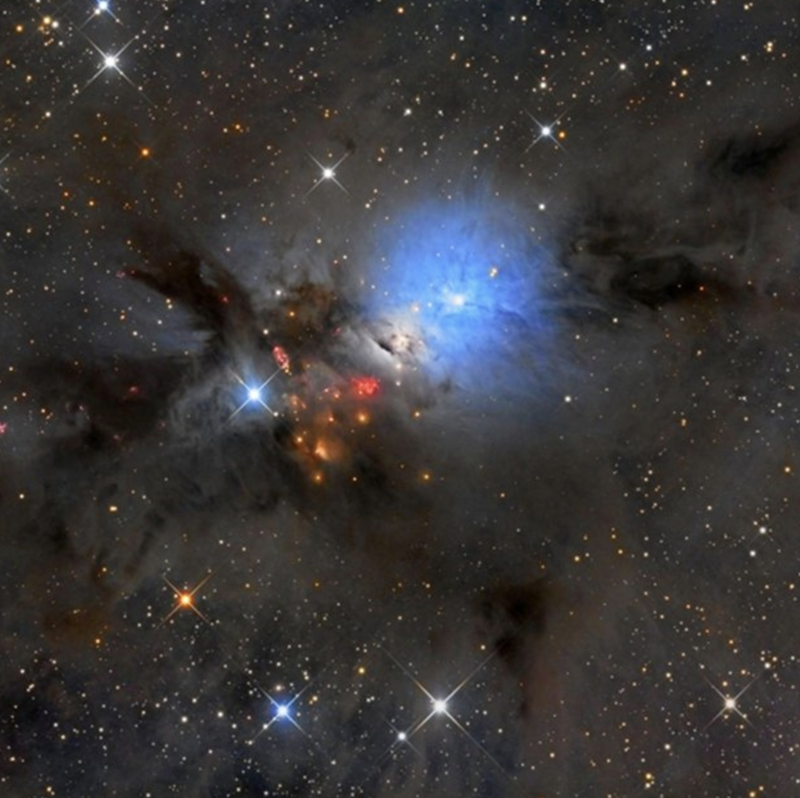 NGC 1333 is seen in visible light as a reflection nebula and lies at the edge of a star-forming molecular cloud. NGC 1333 contains hundreds of stars less than a million years old, over half of them in binary or higher-order systems. The last two decades of observational advances at long wavelengths and in the infrared have painted an increasingly detailed picture of the star formation process. Stars collapse out of dense cores within filamentary structures in molecular clouds. These filaments are generated by the interplay between supersonic turbulence, self-gravity, and magnetic fields. When these cores collapse to form stars, a majority become binary or higher order multiple systems rather than single stars (Duchene and Kraus 2013). 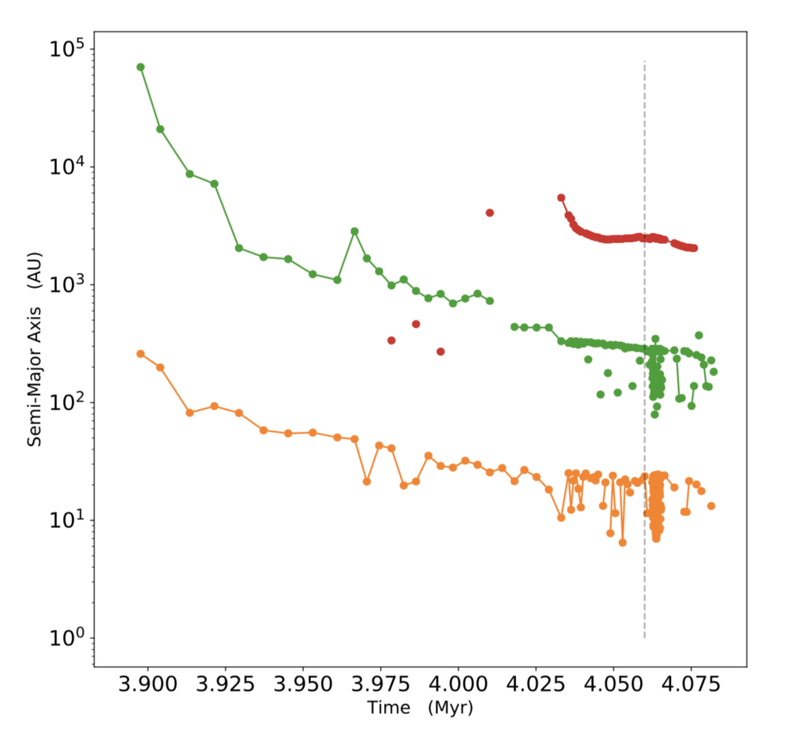 Unlike the initial mass function, which changes little with star forming environment (Offner et al. 2013), the frequency and properties of binary systems do vary from one star cluster to the next (Duchene and Kraus 2013). Thus, binarity appears to be a more sensitive probe of the star formation process. An understanding of binary star formation is required both to explain the properties of the majority of star systems and to gain deeper insight into the properties of the progenitor star forming environments. One of the most fundamental unanswered questions is: why do some filaments and cores produce multiple bound objects, while others produce only single stars? Simulations of low-mass star formation must use initial conditions that are consistent with the observed physical properties of star-forming clouds. As first shown by Larson (1981) and confirmed by many studies, the non-thermal motions within the molecular cloud obey a linewidth-size relation, which relates the non-thermal velocity dispersion of the gas and the size of the cloud. We initialize a 512^3 unigrid domain with uniform gas properties and stir the gas according to the prescription of Dubinski (1995). This method drives the gas in Fourier space by using a flat power spectrum on the large scales. The only difference between the simulations is the strength of the magnetic field, values constituting magnetic field energies that exceed, equal, and are less than the turbulent and gravitational energies of the gas. Once the gas is stirred, gravity is turned on and the simulation commences. Example of the driving phase—initially uniform gas is stirred to create a turbulent power spectrum with large-scale motions that match observations. Late-time snapshot of one simulation. Stars are indicated by the white dots. Many of these stars are clustered in dense regions of filaments, whereas some stars have been flung out into the more tenuous medium. Gravity condenses the regions of enhanced density resulting from the turbulent stirring phase, and eventually these regions enter a phase of collapse. The collapse proceeds until we initialize protostars as individual “sink particles” that can roam around the domain. The number of stars that form is a function of the magnetic field strength: stronger magnetic fields impede collapse and reduce the star formation efficiency. However, the multiplicity fractions between the two simulations are a weak function of the magnetic field: all contain relatively the same number of stars in higher-order systems. The magnetic field appears to be a weak trigger of multiplicity, at least for binaries formed from turbulent fragmentation. Turbulent fragmentation through gravitational collapse results in a clustered system of particles along filaments. These particles accrete from the gas and also gravitationally interact with each other. Sometimes, these systems get a little too close and disrupt. Here is an example of a massive star (center of frame) that roams near the vicinity of a quadruple star system (upper-right) that we will show below. Interestingly, while the disk system gets destroyed, the inner binaries remain bound to each other. Movie of the formation of a quadruple stellar system formed through turbulent fragmentation. Panels show the same system from three different points of view. Dots indicate protostars. Three stars form and begin orbiting each other. Shortly after a fourth member is captured into a large orbit. Evolution of the separations in this quadruple system. The orange curve shows the semi-major axis for the inner-most two stars. Those stars are bound to a third member: the average separation in that triple system is shown as the green curve. Those three stars capture a fourth particle on a large orbit; it’s average distance from the triple system is shown as the red curve. Eventually this system has a close encounter with a large fifth star, which disrupts the system. That interaction begins at the vertical dashed line. Distribution of binaries in the Perseus cloud from Tobin et al. (2016). A bi-modal distribution of binaries is observed. This distribution favors the smaller orbit binaries if we only include the older stellar systems. Evolution of binaries from all three simulations. Wide-orbit binaries form and migrate to smaller separations through dynamical friction and mass accretion, resulting in an older population of stars comprising these systems. Dynamical interactions can maintain wide-orbit binaries, but these are often disrupted and are short-lived. Observations of nearby star forming regions reveal two clusters of binary systems: short-period binaries with separations of ~100 AU and wide-orbit binaries with separations around ~10000 AU. The smaller orbits could potentially form from disk fragmentation or from orbital migration. While our simulations lack the resolution to capture disk fragmentation, we reproduce this bimodal distribution through turbulent fragmentation and migration alone. Short-period binaries are formed from turbulent fragmentation and migration and are composed mostly of older protostars, whereas wide-orbit binaries tend to be younger stars that have just condensed from their core’s gas. Wide orbit binaries can also be maintained through dynamical interactions, but many of those interactions tend to disrupt the binary entirely. The age differentiation between wide-orbit and short-period binaries has observational support.